Election reform • Compromise to end ballot drive is on the way to governor for signature. Rick Egan | Tribune file photo Kids stand by as their parents vote at Pony Express Elementary School in Eagle Mountain, Tuesday, November 6, 2012. Scott Sommerdorf | The Salt Lake Tribune Rep. Dan McCay, R-Riverton, speaks about his bill, HB362 - Transparency in Collective Bargaining Process - in a House committee meeting, Wednesday, March 6, 2013. 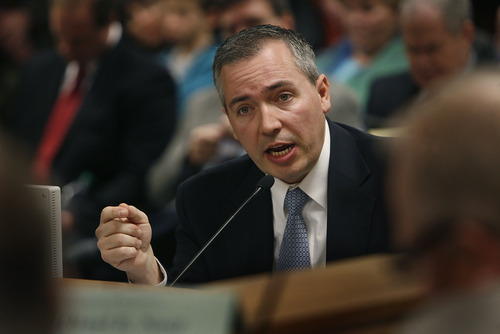 Al Hartmann | The Salt Lake Tribune Rep. Ken Ivory, R-West Jordan, speaks on the floor of the Utah House on Wednesday, July 3, to amend a part of HR 9001, which would create a special committee to explore allegations of misconduct against Attorney General John Swallow. 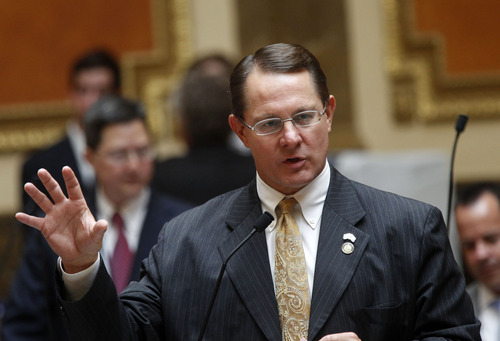 Despite grumbling and constitutional doubts, the Utah Legislature sent a deal to Gov. Gary Herbert that will overhaul the process for choosing candidates for office and bring to an end Count My Vote&apos;s ballot initiative. "I don&apos;t argue that this policy will be better than the caucus-convention process," said Rep. Dan McCay, R-Riverton. "The vote today is not whether you like one [nominating system] over the other. … Your vote today is &apos;do I preserve a history at the same time I grab the future?&apos; That is this bill." While the bill, SB54s2, lets parties keep their existing caucus-and-convention system for nominating candidates, it also allows aspiring officeholders who collect enough petition signatures to go straight to the primary ballot. It also imposes certain requirements on state parties, and James Evans, chairman of the Utah Republican Party, has said the party has the right to nominate its candidates as it sees fit. Previously, he said an attorney the party hired recommended they not participate in the negotiations because it could weaken a potential lawsuit. The measure is the result of a compromise between legislators and leaders of the Count My Vote initiative movement, which collected more than 100,000 of the 102,000 signatures needed to let voters decide whether to supplant the caucus-convention system with direct primaries. Given the likelihood of Count My Vote getting on the ballot and passing, Sen. Curt Bramble, the sponsor of the measure, had said that it was prudent to negotiate a resolution. Count My Vote has agreed to abandon its ballot initiative once the governor signs the legislation. "I applaud their efforts of trying to find a compromise that protects the convention-caucus system, which I&apos;ve been a big supporter of in the past, and yet provides opportunity for a general primary and a different pathway to the ballot," Herbert said before the Legislature&apos;s final passage. Taylor Morgan, co-director of Count My Vote, said his organization is excited the bill passed, saying it melds the best elements of the current system and a direct primary path. "What we&apos;re most excited about is that we are now opening Utah&apos;s primary election to unaffiliated voters. Our initiative alone did not have the ability to do that," he said. Under the bill, the more than 660,000 unaffiliated voters  those not registered as a member of any political party  could vote in whatever party primary they choose. But critics of the deal contended SB54s2 would lead to the demise of a nominating system that has served Utah well. "I would argue what we&apos;re doing is causing the death of the caucus-convention system," said Rep. Jon Stanard, R-St. George. "Within a number of years it will not exist if we pass this bill." And Rep. Ken Ivory, R-West Jordan, said the state has no right to tell parties how to pick their nominees. "The fact remains the rights belong with the party," he said. "I think we tread on unconstitutional territory to be intermeddling with the internal affairs of the party." Rep. Brian Greene, R-Pleasant Grove, said he is a strong supporter of the caucus system "and as such I can not vote for a bill that signs its death warrant." But Rep. Kraig Powell, R-Heber City, said parties can associate however they wish, but when they want to put candidates on the public ballot for a taxpayer-funded election, they have to comply with the requirements from the Legislature. "I believe this bill is not only legally supportable, but I believe it is politically absolutely crucial," said Powell, "because it is the type of thing voters of this state … are asking for, and they have a right to do so." The bill, sponsored by Bramble, R-Provo, passed the House Wednesday, 49-20, and went back to the Senate, which also approved the measure, 21-7. Sen. Todd Weiler, R-Woods Cross, said he believes the Count My Vote effort was never about the will of the people. "It was about the will of the few wealthy people who wanted to have access to the primary ballot without having to meet with the ordinary people who got elected as delegates," Weiler said. Under the framework in SB54s2, a candidate running for statewide office would need signatures from 28,000 voters to get on the primary ballot. A quarter of that number would be needed to run for one of the four congressional district seats. State Senate candidates would need 2,000 signatures and House candidates would need half that number. The signatures could come from any registered voter, regardless of party. Rep. John Mathis, R-Vernal, said it was "troublesome" how few signatures would be needed to get on the primary ballot in rural counties. The bill requires candidates to gather signatures from 3 percent of the registered voters. In places like Daggett County, that is just a few dozen or, as Mathis put it, "a family home evening group getting together." Bramble acknowledged there were problems with the bill that would have to be worked out, including the treatment of rural counties. Another is the potential that numerous candidates could get on the primary ballot and end up winning a party&apos;s nomination without capturing a majority. House Majority Leader Brad Dee said those are issues that the Legislature can address next year  because the changes to the nominating process will not take effect until the 2016 election. Contrary to those who contend SB54s2 destroys the caucus system, Dee said he believes the bill is "the right way to preserve it, rather than let someone have control of it." "I&apos;m hoping that five to six years from now it&apos;s stronger than it is," Dee said. 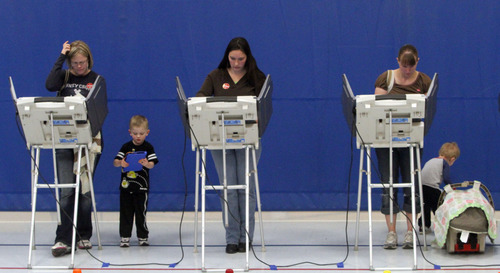 "It is in the electorate&apos;s hands … the voters and the citizens. This is where they need to take their responsibility and become involved."